It's OwlCrate time again! Whoop, whoop! I have to say that receiving my monthly OwlCrate is one of the best parts of my bookish life. If you're unsure about what's about to happen in this post and you're unfamiliar with OwlCrate then let me help you out! 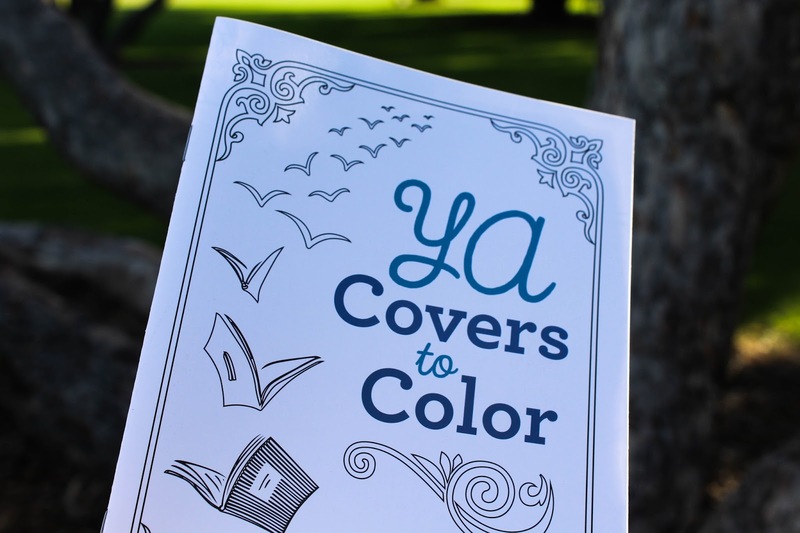 OwlCrate is a monthly YA (Young Adult) subscription box. Each box has a certain theme that is centred around the book that's included. In each OwlCrate you'll find one new release YA hardcover book, 2-5 bookish goodies, and usually some book swag (signed bookplates/letters from the author/promotional bookmarks/etc!) An OwlCrate subscription costs $29.99USD per month + shipping (there's a coupon code at the end of this post for 15% off your first OwlCrate at the end of this post, though!) I really can't recommend this subscription box enough! I was lucky enough, as a representative for OwlCrate, to receive the July 'Good Vs. Evil' box. This box was very different from usual because OwlCrate sent out two different boxes! One 'Good' and one 'Evil', all the items were sourced from the same shops but one set of boxes got good characters while the other set good the baddies! I really thought this was a unique and interesting idea and I think that a lot of people loved it. 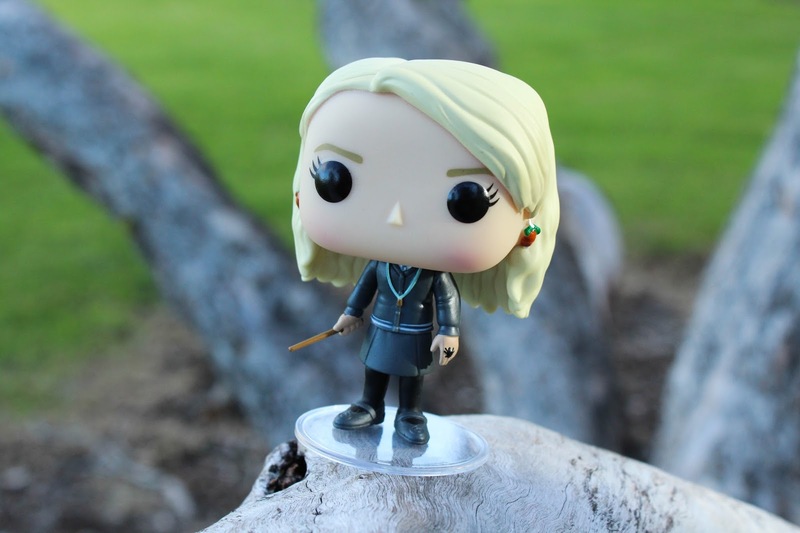 The first item I pulled out of the box was a Luna Lovegood Pop! Figure from Funko! I was so incredibly excited, especially since I'd seen a Luna on special at my local EB Games and almost bought her?! I really love it when bookish subscription services send out Funkos, they're super popular among the bookish community. The other character that I could have received was Dobby, and I would have been over the moon with either character! 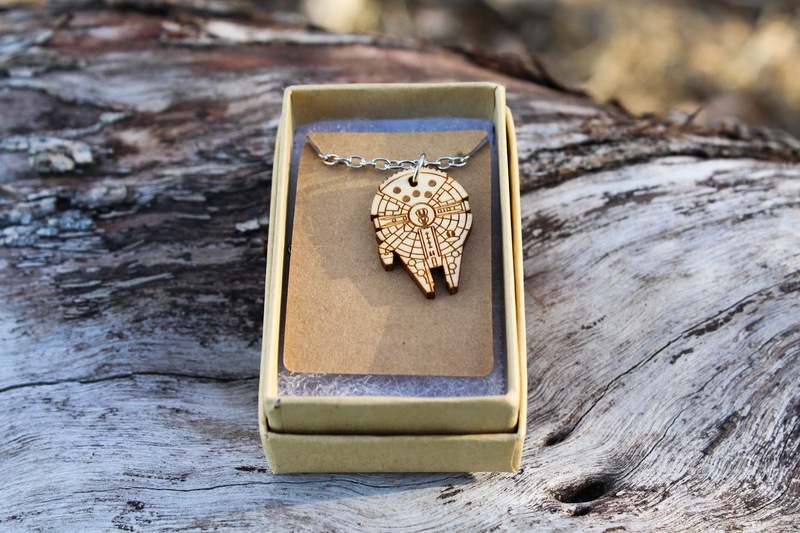 Next up was this Millennium Falcon necklace from Vector Engraving which I instantly fell in love with! Now, it's only been recently that I've started watching the Star Wars films again but I was so thrilled to get a piece of geekery that I can wear to the next film! We've had an item by Vector Engraving before, in the February OwlCrate if I'm right, and they are always amazing quality! Those who received the 'Evil' box got a Death Star necklace instead. 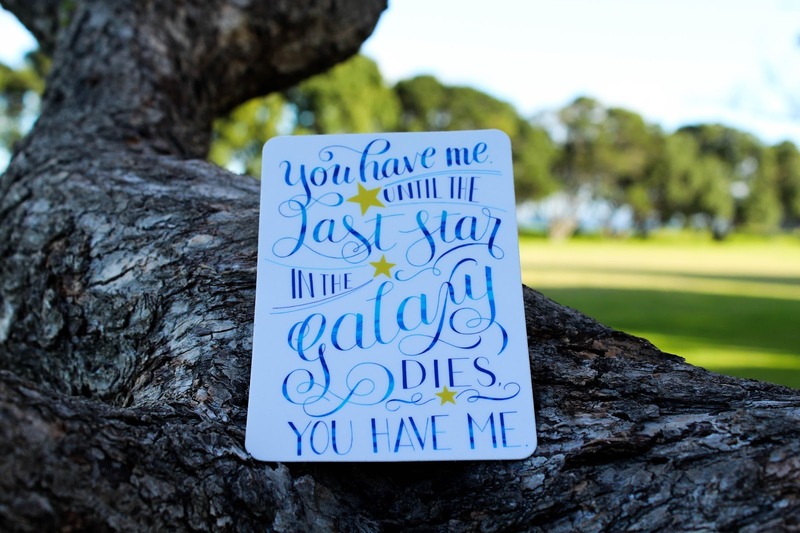 Next up was this huge and gorgeous sticker from Drop And Give Me Nerdy (you may also know the creator from Nerdy Post) with a quote from Illuminae by Amie Kaufman and Jay Kristoff that reads "You have me until the last star in the galaxy dies. You have me." which is incredibly lovely! The sticker is fantastic quality and I love the watercolour effect that the lettering has over it. The only negative was that another item from the box was stapled and because things were resting on top, the sticker has a lot of dents and scratches on it (not that you can really tell) but maybe a bit of protective plastic or wrap could have made this better. Those who were on the side of Evil received a sticker inspired by Illumiae as well, I believe, that read "Am I Not Merciful?" their sticker was circular and red and black, equally as lovely as the 'Good' sticker! 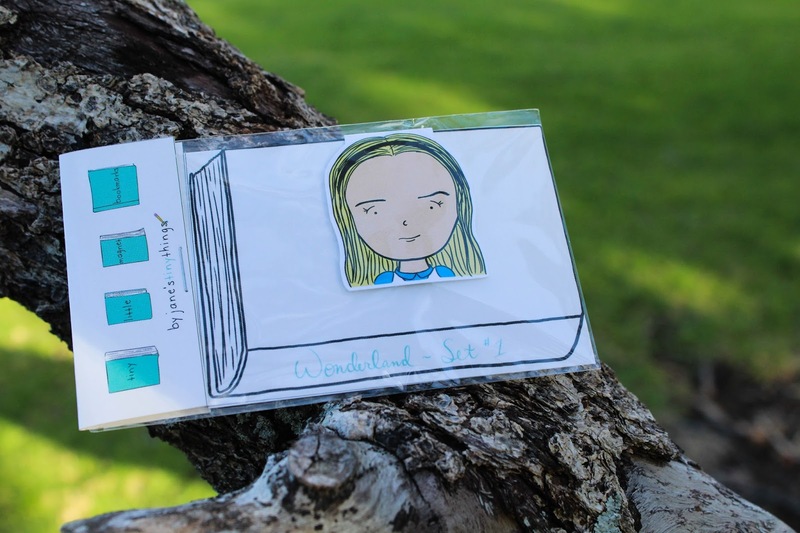 This magnetic bookmark was also included in the July 'Good' OwlCrate and was made by a company called Jane's Tiny Things. I've seen this company advertised all over Twitter and Instagram so it was neat to receive an item by them to try for myself. 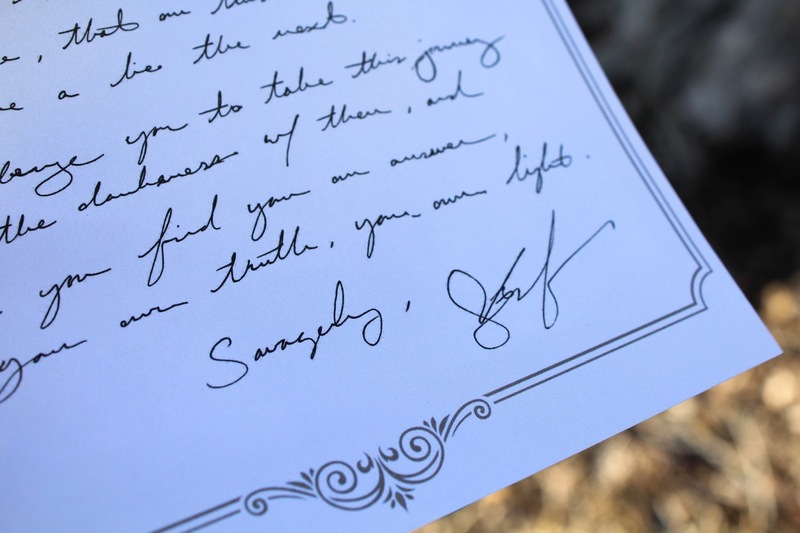 The back of the bookmark has a quote on it, and I cannot believe I didn't photograph it, but it reads "I knew who I was when I got up this morning, but I think I must have changed several times since then" - Lewis Carroll and is written in cursive. The bookmark itself is really great quality and actually on the larger side considering it's referred to as 'tiny'. On the back of the bookmark card we also get a sneak peak at the second character in the Wonderland - Set #1 pack from Jane's Tiny Things and that's The Queen of Hearts! 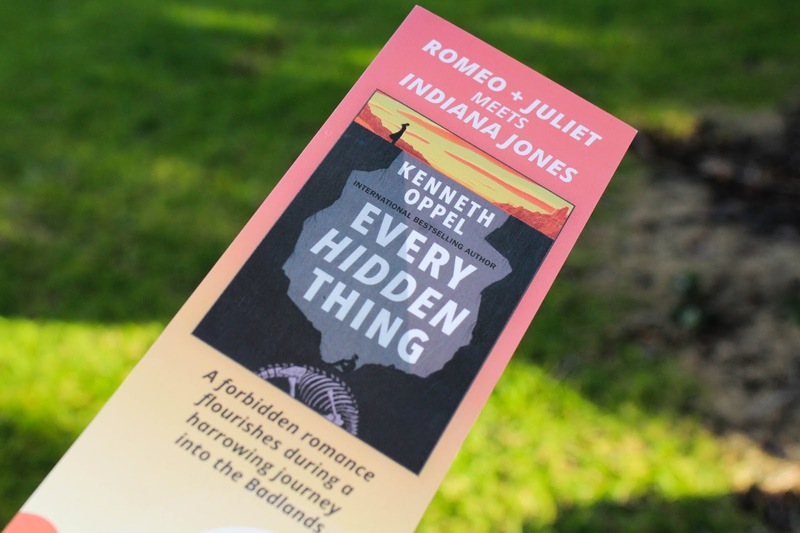 Personally, I prefer the Queen of Hearts bookmark, so one of my fellow Booklanders Book Club members will be swapping next time we have a meeting. I think that another reason the 'Good Vs. 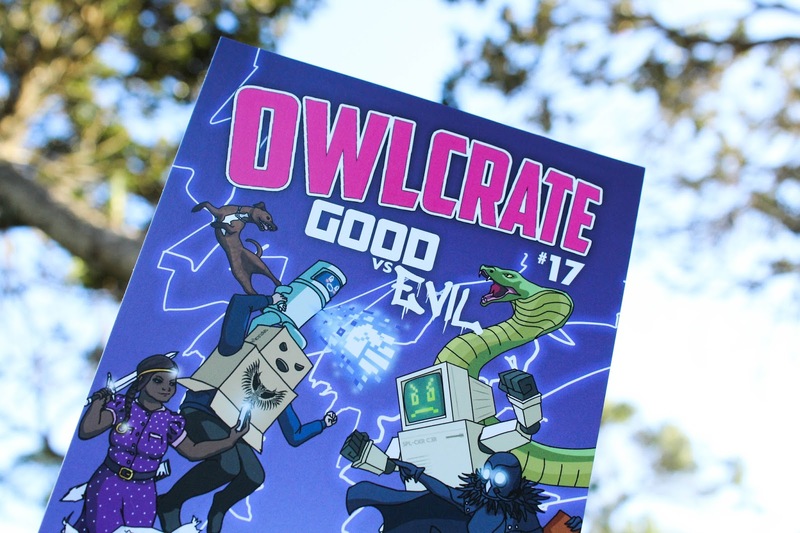 Evil' boxes were so neat is that friends who subscribe to OwlCrate could trade items with one another. Now, on to the book we received! "There’s no such thing as safe in a city at war, a city overrun with monsters. In this dark urban fantasy from author Victoria Schwab, a young woman and a young man must choose whether to become heroes or villains—and friends or enemies—with the future of their home at stake. The first of two books. Kate Harker and August Flynn are the heirs to a divided city—a city where the violence has begun to breed actual monsters. All Kate wants is to be as ruthless as her father, who lets the monsters roam free and makes the humans pay for his protection. All August wants is to be human, as good-hearted as his own father, to play a bigger role in protecting the innocent—but he’s one of the monsters. One who can steal a soul with a simple strain of music. When the chance arises to keep an eye on Kate, who’s just been kicked out of her sixth boarding school and returned home, August jumps at it. But Kate discovers August’s secret, and after a failed assassination attempt the pair must flee for their lives." I was really thrilled to receive such a beautiful edition of this book, I haven't read anything by V.E. Schwab before but have heard only amazing things! I do think, however, that this book was a tad too highly anticipated to be included in an OwlCrate, I think some people even ended up with three copies! 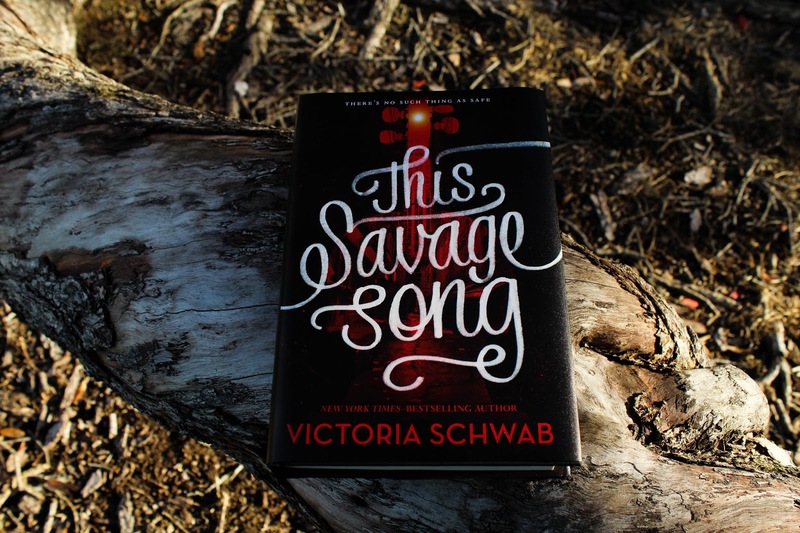 This Savage Song made its way straight onto my TBR and I cannot wait to pick it up! 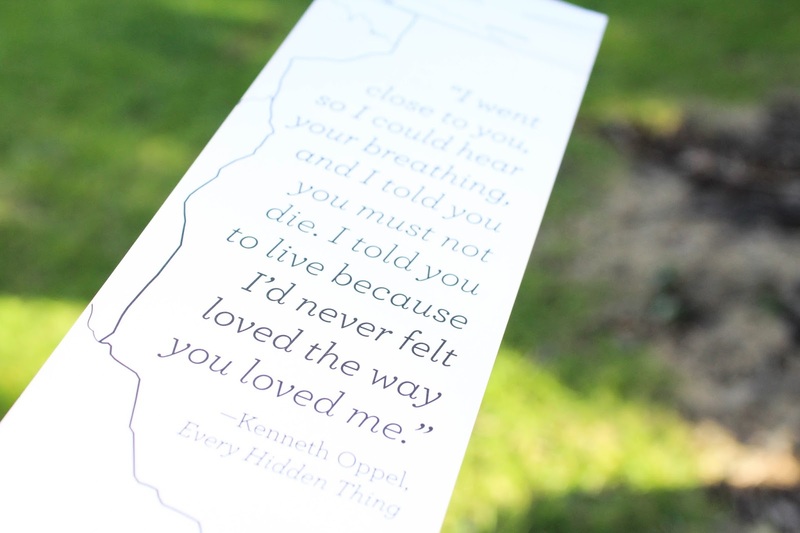 One of the pieces of bookish swag we received in July's OwlCrate was this promotional bookmark from Every Hidden Thing by Kenneth Oppel which looks really interesting! We also got a letter from the author of This Savage Song and a colouring book that is a collection of Harper Collins covers. 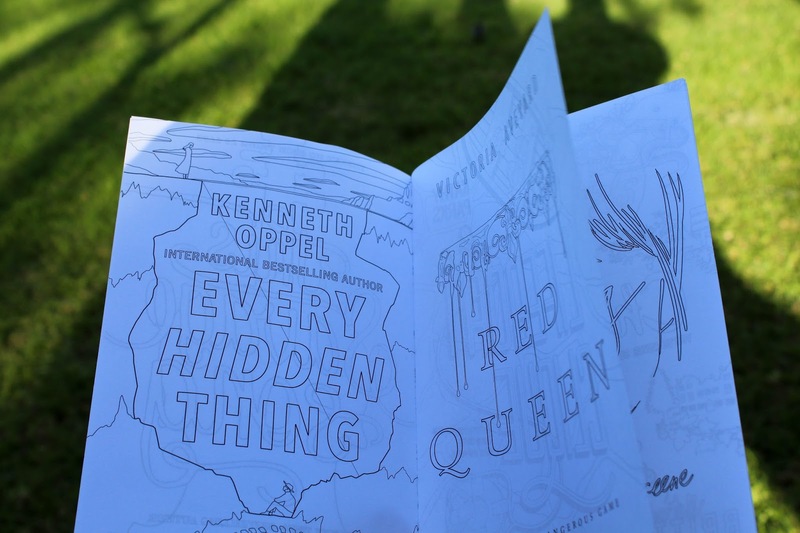 I've already seen quite a few people break out their colouring pens/pencils and start working on their book. Edit: We also got a signed bookplate from the author! I totally forgot to photograph it! That's it for the July OwlCrate! The August "Fast Times at YA High" boxes are on sale now and they're running out fast! OwlCrate says: "This box will feature a hilarious high school love story by one of the reigning queens of contemporary. It will also include items inspired by some of our favorite high school sweethearts in YA, as well as items inspired by the school of our dreams, Hogwarts! This is a super fun box which includes many exclusive items you can't find anywhere else! Signs up for the August box will open up towards the end of July." Sounds amazing if you ask me! I'm always keen for some more Hogwarts merchandise. We've only had one sneak peak this month and that's that one of the items is an exclusive piece from Susanne Draws - I am absolutely in LOVE with her work so I cannot wait for this piece!! If you'd like to sign up for OwlCrate you can use the code BKWORM15 to receive 15% off your first box or a gift order for a friend. Head to the OwlCrate website and enter the code at checkout! Hope you guys enjoyed this write up! Did you receive a July OwlCrate? Which one did you get, Good or Evil? What was your favourite item?